Looks like the 5DS is coming pretty soon. This particular camera is best suited for landscape photographers and those interested in creating archival level shots. Shots which produce the best color and most detail. There will be two models. One with the low pass filter removed and the other with the low pass filter. The low pass filter reduces detail in shots, but it decreases moire. I believe its impossible to make a one-size fits all camera body and thats what Canon attempted to do with the Canon 5D Mark III and the 1DX. The landscape and archival crowd cried out for better color and higher megapixel. However, the event and sports crowd doesnt care so much about megapixels as they do with speed and low-light ability. The Canon 5Ds, however, will probably be the ideal portrait camera as it will produce exacting color and high detail. Later on in the year will come the Canon 5D Mark IV or a variant on that theme. That camera will be more geared for the sports and event photographer. I do know a certain photographer who whips out a Mamiya medium frame film body for the wedding portrait and out comes the 5D Mark III for the rest of the wedding. The reality is that probably most people would be happy with the pictures from the 5D Mark III or the coming Mark IV/1DX II for portrait work. The 5DS takes it a few steps further to satisfy those pixel peeping photographers not satisfied with the detail and color from the usual 5D series. If I put two landscape photos on my wall or on the internet created with the 5D Mark III and the 5Ds Im guessing most people wouldnt be able to really tell the difference. People who are more "in the know" might be able to list the differences and especially the pixel peepers who zoom in close. Most people would pass by and would wonder why they put up two same looking shots. I thought everyone here would be watering at the mouth for the Canon 5Ds, forks on the table, desk pounding, that sort of thing. Im looking forward to it. Its going to be the sharpest Canon has produced especially the elimination of the low pass filter. They aimed this right at the photographer who demands maximum detail and sharpness. I think it will still be good for event work and sports. To be honest, I dont get past ISO 3200 these days. This can go to ISO 6400 and dont think I will have a need past that mark. That's an impressive feature set, 50mp is going to demand some serious storage requirements. Megapixels is something most event / wedding photographers are probably not too interested in, no point in buying such a beast and dialing down the mp's. However landscape and architectural photos are going to love this. Any ideas on approximate price? Ive seen some pictures from these high megapixel cameras, i.e. medium frame digital, and the detail is simply amazing. You zoom in on a window and can see the person making something in the kitchen. I think it would be very useful for event photography in some instances. The participants can zoom in on minute details which can be very cool. Also, lets say you brought the wrong lens and dont have enough zoom. Cropping is made a lot easier with more megapixels. I dont find myself going above 6400 iso, but I do know some people use higher and get away with it in web photos and print. It will certainly be a lot of storage. Where I've found the massive detail of the Nikon D810 especially useful, is with lifestyle type photo sessions with kids. Kids zip around unpredictably when playing. Eg, kicking a ball in a park or just running around. The huge resolution allows me to crop in heavily and still have a 15+ megapixel file! If I were to get a camera without a low pass filter, would any software out there today be able to correct the moire (if it does occur) 100%? Would my DXO software, which claims to have an "anti-moire" feature, be able to correct it? I have to say that some devoted Canon owners, like myself, were itching at some new bodies. The Canon 7D Mark II seemed like just an incremental update to me (my personal opinion mind you, other opinions differ) and it didnt seem like the quantum leap I was looking for. The 7D Mark II didnt seem like the Nikon-eater I was expecting. The camera that would jump out and grab Neil's Nikons by the teeth and disappear back into the swamp in dramatic fashion. After all the Canon engineers had several years to design something much much better. What were the engineers doing all this time? Im wondering if this 5DS and the up-coming 5D Mark IV will be the camera that keeps the Nikon (and Sony) shark at bay. I dunno. Nikon seems to have been very aggressive...but I keep the faith in Canon. Lets hope that faith is not misplaced. There have been a few sports events Ive been to where I didnt exactly have the best seat. This has also taken place at some fashion events. Experienced photographers know what I speak of. You get to the event to find a gang of photography guys who have taken all of the best seats. You find yourself far away. Actually, this is exactly why I got the Sigma 120-300 2.8 Sports so that when that time comes where the photography gang robs me of any choice position I can move a bit back and use that extra 100mm to make up for it. I remember at the Mercedes Benz fashion show this situation happened to me. I sat there with my monster lens and people looking at me funny. Dont mind me, just trying to get a shot. In the past when I didnt get the best position, I would try to make up for it with cropping. You can only crop down so low however before the image becomes unusable. So the high megapixel will help in these situations where I need to make up for a bad position. I was just reading the Canon 5Ds will have comparable ISO performance to the Canon 5D Mark II (not Mark III). So this will be a step back in terms of low-light ability. However, if there is enough light it should be quite a few steps up in picture quality. So the 5Ds will not be replacing anyone's 5D Mark III for the upcoming event season (wedding season) over the summer. I see the 5Ds for those who do their photography mainly in the sunlight. It could be used for events just like the Canon 5D Mark II was used for events, but I dont see anyone wanting to give up the ISO performance. Around these parts where events tend to take place in low light we need all the performance we can get. My expectation is for a Canon 5D Mark IV to come in the fall and that it will be geared for sports/event photography. So the Canon line will no longer have one size fits all bodies. The Canon 5Ds is ideally for landscape and bright sunlight or studio photography. The Canon 5D Mark IV will be geared strictly for sports and event shooters. My expectation is for an 18 megapixel sensor on the Mark IV along with every trick in the book pulled to gain ISO performance. This leaves many photographers with a problem. Do they get the Canon 5Ds or the 5D Mark IV? Most photographers have fairly low margins and their income isnt so steady. I am guessing many photographers will have an issue with getting both models. Will the garden variety wedding photographer get both models? Which one will they stick with? During the past few seasons, Ive seen quite a few well used bodies among the wedding photographer crowd to include the original Canon 5D. Some may choose to just stick with what they have. One dealbreaker of this body is it doesnt have the same iso performance as the trusty Canon 5D Mark III. During events I find myself taking the body to what I believe is the limit where after that I think noise might be a problem. So Im really wondering if I have a need for this body. I did read an article on a Canon website where they put it like this. If you operate an assembly line like photo business where the line cant stop get the 5DS. However, if you are the type who really examines each photo and wants to take it to the limit get the 5DSR. I did poll different photographers and forums. Many believe that moire only appears 1 in 500 photos with the 5dsr. Some believe there will be some level of moire with both cameras but there will be less in the 5DS and thats IF moire decides to show up. There needs to be certain conditions for it to show. If you do operate an assembly line like operation churning out photos even 1 in 500 might stop the line and lose cash. Peter Hurley who does just that, churns out headshots daily, says he wouldnt mess with it and get the 5DS. A friend of mine who is a Canon Explorer of the Light...whoohooo...says he would get the 5DSR because he is one who truly examines each photo closely before publishing and closely during the shoot and right after. In terms of ISO performance think half that of the 5D Mark III. I regularly push my Mark III to 3200 and post process it with DXO Optics 10. So figure I could push the 5DS to 1600. I called my buddy who is intimately familiar with this model. He says Im wrong and to think 800 iso. No further than 800 with this thing. In any event you wont be shooting the wedding with the 5DS unless that wedding is outdoors in the daylight or they allow for a fairly strong flash system during the ceremony. I think you can write this body off if you are an event photog unless you can somehow work at the lower iso range. This body was meant for the daylight or a tripod at night with long shutter speed, but not the ceremony in the dimly lit church. The only thing I can say Michael: "Ouch!" Its not all bad. It just depends on what you aim to do. Its an awesome camera if you have enough light. 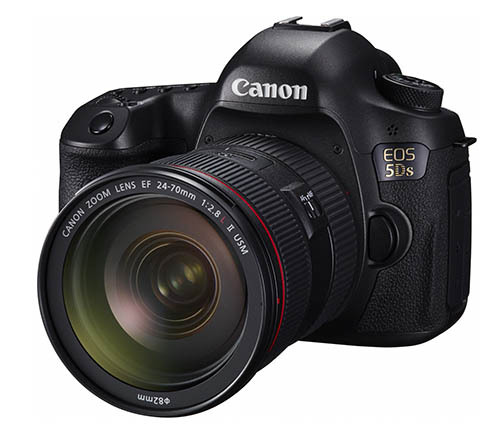 Luckily, Canon has the 5D Mark IV in the line-up for Q1 2016. Isnt 2016 an Olympic year? Canon is all about the Olympics and so their release schedule is catered to the Olympics. To be very honest, the 7D Mark II did not have my mouth foaming, but I never touched the camera. Just saw the stats and I expected something that would thrash the likes of Sony and Nikon. I want to be fair and say I didnt compare and review all of them which would be the proper thing to do to come to that conclusion. I also recognize there is more to a camera than whats on the spec sheet. When you start shooting, it becomes very apparent and you really need to have it in the hand to find out. Im just saying I was expecting a bit more on paper. You said it was a good camera and I trust you on that. I have no plans on sinking any cash into APS-C platforms so for myself its a moot point. Im hoping the 5D Mark IV will be something that really screams both on paper and in the hand. So this is more a Landscape photographer's camera. Or Commercial. Or product. Then again, you don't want such high megapixels for weddings and events. So if the 5DS doesn't perform wonderfully at higher than 800 ISO, it shouldn't really be a problem. Let me clarify my remarks above. The Canon 5DS/5DSR should have the same iso performance as the Canon 7D Mark II. The Canon 5DS/5DSR is built with the 7D Mark II technology. Im not a camera engineer so I cant explain exactly. When I say the 7D Mark II did not impress me I speak mainly of iso performance which is my primary concern these days. I find myself not going beyond 3200 iso because it becomes too noisy for my tastes. Im looking for a body which can blast through ISO 3200 to the 4000 to 6000 range while keeping within my self proclaimed noise standards. I dont have the equipment to measure ISO performance nor do I have all the bodies so I rely on internet reviews. The Canon 5DS/5DSR should be 1 stop of light behind the 5D Mark III. 1 stop as we all know is basically twice the amount of light. So if my tastes say 3200 ISO is my limit then I wouldnt be able to go past 1600 with the 5DS. So whatever ISO you used with the 5D Mark III think half of that. Thats what you can use. My buddy is a high end commercial photographer who teaches classes and is an Explorer of the Light. He is an encyclopedia of camera knowledge. He tells me he would not push it beyond 800. His taste for noise is far more conservative than my own. I imagine he wouldnt take the Mark III past 1600. I am very comfortable taking it into the 2000 to 3200 range. There are a few fixes to get around the need for more ISO such as the use of flash. Another method is using stabilized lenses and low shutter or a monopod/tripod. I am guessing the Canon 24mm 2.8 IS, 35mm 2 IS, 16-35 F4 IS, 24-105 F4 IS, and of course the stabilized zooms will become more of a staple for those using this particular body to get a better shot in the dark hours. Either that or they might have to tote around the mono or tripod.